This 100 percent Cabernet Sauvignon hails from a special barrel representing the Mount Veeder component of our renowned Lot 1 bottling. The vineyard sits at 1,300 feet above the valley floor with expansive views of Napa Valley and beyond. Truly a one-of-a-kind wine with black fruits, spice and mouthwatering tannins. Michael Eddy, who grew up in Southern California, became fascinated by the process of transforming grapes into wine after brewing beer at home. "The complexity of wine has always intrigued me," explains Michael. "The idea of navigating all of the steps it takes to bring out different flavors in a wine really appeals to me." As Director of North Coast Winemaking for E. & J. Gallo Winery, Michael oversees winemaking teams at the Gallo of Sonoma Winery, Louis M. Martini Winery and William Hill Estate Winery. He also collaborates on Gallo Signature Series, an acclaimed collection of wines crafted by third-generation family winemaker Gina Gallo. Michael finds Gallo an exciting place to work, thanks to the tremendous resources available. "Winemaking is about choosing the right materials and using innovative techniques to achieve your vision, and Gallo affords an incredible array of resources and a broad range of tools," he says. The Winery's impressive estate vineyards, its historic Monte Rosso Vineyard in Sonoma Valley, is Michael's favorite. Michael earned his bachelor's degree in Biology from Humboldt State University in Northern California, later pursuing a master's degree in Food Science, specializing in oenology, at the University of California at Davis. 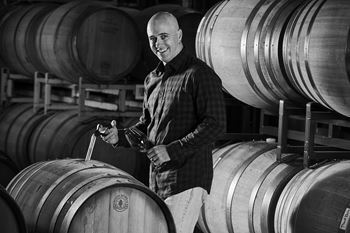 After stints in winemaking at California's Trefethen Family Vineyards, Beaulieu Vineyard and Rodney Strong Vineyards, Michael joined Gallo in 2005 as an associate winemaker, initially focusing on Cabernet Sauvignon and Merlot. I think I'd summarize it as this: Every choice you make in the vineyard and in the winery has an impact on how the wine ends up tasting in the glass. Every one of them. That ends up being thousands of choices (if not more). Some of the choices have a small impact and some of them have a large impact. The challenge for a winemaker is to pour the appropriate attention and effort into those choices that have the biggest impact. It requires mindful focus of effort and that often means choosing where NOT to place too much effort. There are only so many hours in a day and in a growing season.